We Went For GOLD And Won! In early December last year, we announced that we were working towards improving our FORS accreditation from Silver to Gold Standard. So we’re delighted to have recently been informed that after months of hard work, we have finally been awarded the coveted accreditation. 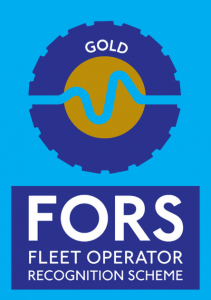 We are now recognised FORS Gold Operators (ID Number: 007606). The Fleet Operator Recognition Scheme (FORS) is a completely voluntary accreditation scheme that promotes best practice for commercial vehicle operators like ourselves. It encompasses all aspects of Fleet Management, Vehicle Management, Driver Responsibility and Operations. It does this by encouraging and training fleet operators to measure, monitor and improve their overall performance. “This is a fantastic achievement for TEKFLOOR and it’s a real testament to the hard work that has been put in across the company.